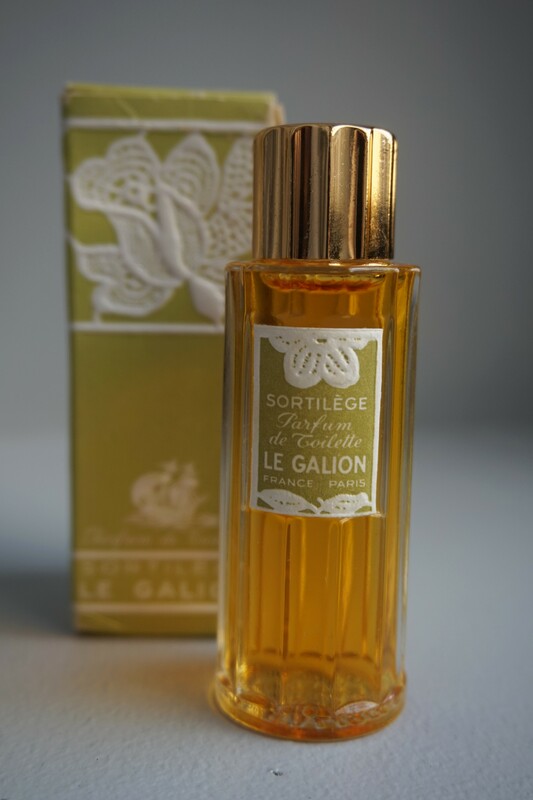 Some people compare Sortilège to Chanel No.5 or Coty L’Aimant (Le Galion 1937), but in my estimation, while there are certainly some striking resemblances, it’s a very different scent. Sortilege is more bitter, a bit deeper and more citrusy than L’Aimant. Where L’Aimant is powder to the extreme, Sortilege is only a bit powdery and its sweetness is more rich and warm and less saccharine. Chanel No. 5 is almost an entirely different scent to my nose. Simply put, No. 5 is Chanelesque, Sortilège is certainly not a Chanel but shares more of a burning, sweet styrax glow of other vintage 1930’s scents. Sortilège is dewy, a little green, spicy and in the drydown it transforms into a mellow, sunny embrace. It’s a bit wild too. The styrax and opoponax mix with amber to create a little mischief… Sortilège is a scent unto itself. Top notes: bergamot, peach, aldehydes, orange blossom. Heart: lily of the valley, jasmine, ylang-ylang, rose, violet, lilac, and orris root. Base: musk, oak moss, sandalwood, vetiver, tonka, vanilla, oppoponaks, styrax and amber. It all happens rather suddenly. Mother arranges to send me to Minneapolis to be with her sister. I’ll live there a year. I don’t see George at all, until the day I leave. Gracie, who is now nearly engaged to Pat, must have told George the time I was leaving. George shows up at the train depot with a bouquet of flowers. I shake my head back and forth and fight back tears, but it doesn’t work. He stands there and watches me cry for a second before he grabs me. When he holds me it feels forced and yet I’ve been missing him terribly so mind rumbles into an internal battle. I keep telling myself that he doesn’t care and that I can feel it, but his arms sing lies so sweet and convincing. He grabs my head in his hands, then he kisses me. “I love you too,” I say when we stop and then immediately wish I hadn’t. We stare silently at each other, then our gazes look off in differing directions. “Why did you hurt me so much?” I ask, trying to bring myself square with reality. “I have to go now. I have to go now, George.” He doesn’t seem to hear me. Then suddenly he rises and brushes himself off, and stands in front of me with a pitful look on his handsome face. “I know,” he says as he grabs me and fills my mouth with kisses This time my sister Louisa sees us as she’s coming around the corner to fetch me. The sky is drifting into a hazy blue and red toned twilight. “Beth! Your train is here,” she announces before she can fully absorb the scene before her, then her voice trails off. “Beth.” George pushes me an arm’s length away and then grabs my hands for a second while he locks into my eyes with a weepy desperation. I walk away, backwards, slipping away from his grasp. He stands there still frozen in a state of pleaading sadness. I quickly say goodbye to my family before boarding the train and then I find my seat. It’s conveniently next to a window, and as I look out I see my family waving, and in the background I see George. Our eyes meet. He mouths the words, “Don’t leave.” I feel a pull at my heart to stay, but the train has started taking off and the love I felt for him has been replaced with indifference and some anger. I cried until it died. The door is shut. I can’t get off the train and I don’t want to, so I just stare in numb silence until I can’t see him anymore. It gets darker by the minute as we pass small towns that light up and then fade quickly. It’s been another difficult week… GRR! Enough already. But… we’re blessed. We really are. Sigh. I hope you’re having a pleasant week though, dear reader. Are you? Hopefully the rest of the week and the weekend will end nicely for everyone.